Last month, we kicked off a series of posts on transmedia storytelling–what it is, how it works, and how you can use transmedia storytelling techniques to reach more readers and provide readers with a deeper, richer story experience. You can view a complete list of back posts here. 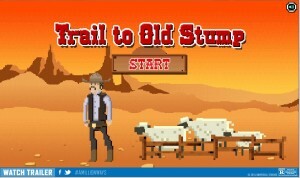 The “Trail to Old Stump” game is an example of transmedia advertising–the movie makers used a video game platform to entice a different audience segment to learn more about the movie, and this audience segment might not have checked it out otherwise. It’s not transmedia storytelling, though, because it doesn’t add to (or even retell) the story told by the movie. It’s just a bit of fun to attract more viewers. If you have teens in your house, you’ve probably seen the same progression I have. Although we started out with the best of intentions to monitor and limit our kids’ time online, it’s become more and more difficult with each passing year–and not just because my boys are older and more independent. Over the past decade, more and more of kids’ activities have gained an online component. That’s where they go for entertainment. That’s where they collaborate with classmates (simultaneous editing on a Google doc, anyone?). They have to check class notes and assignments online; they have to have internet access in order to complete homework; and when they finish assignments, those get turned in online as well. According to a study conducted by the Kaiser Family Foundation, today’s young people spend more than 7 1/2 hours consuming media–streaming music, checking social media, Web surfing, playing video games, etc. Add in the growing tendency to multitask? Researchers found that during that 7 1/2 hours, they packed in an average of 11 hours of media content. Have you seen the same trend toward increased time online in your home? Please share your thoughts in the comments!